is a full-featured weaving application for Mac operating system that designed for the weaver who wants to design drafts creatively. It requires MacOS 10.11 or greater (Mac OSX is now called MacOS). Extensive on-line help and glossary of weaving terms. Edit in one window, while display warp-faced, weft-faced, variable-width or double-weave in fabric window. Changes are immediately displayed in both windows. Cut and paste threading or treadling between patterns. Display threading at bottom of screen with treadling going up. 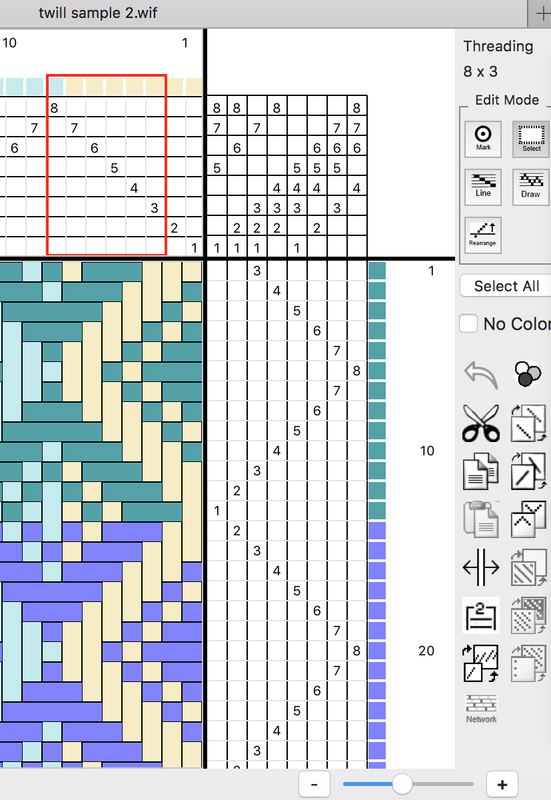 WIF weaving independent file format allows you to exchange weaving drafts with other weaving programs. Edit and display draft as lift plan. Easy to create and edit threading and treadling and tie-up drafts. Create twill tie-up quickly by entering in first column. Re-arrange shafts or treadles for more convenient weaving. 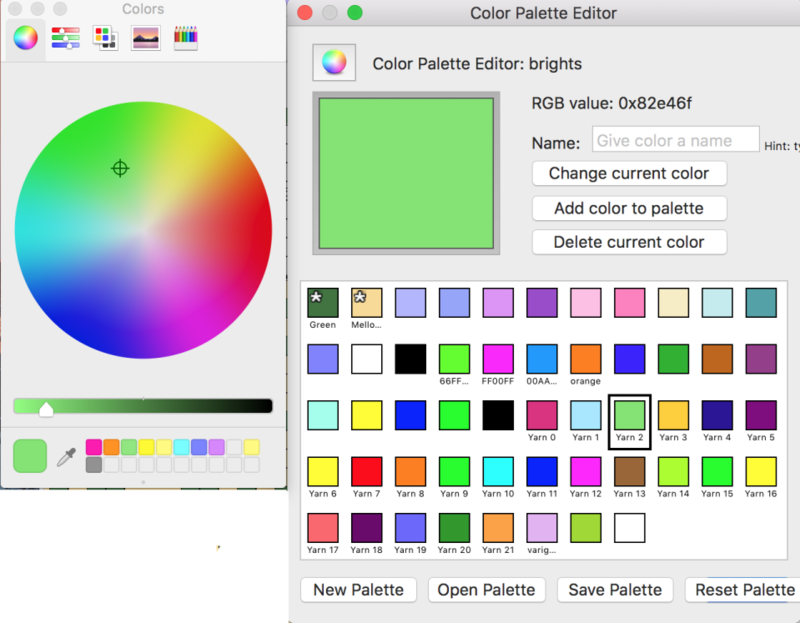 Create custom color palettes with unlimited number of colors. Select and quickly change color when editing draft. Variable width for a yarn color can be set to appear everywhere its used. Yarn colors can have names and types. Color n' weave effects can be created. Computes number of warp ends. 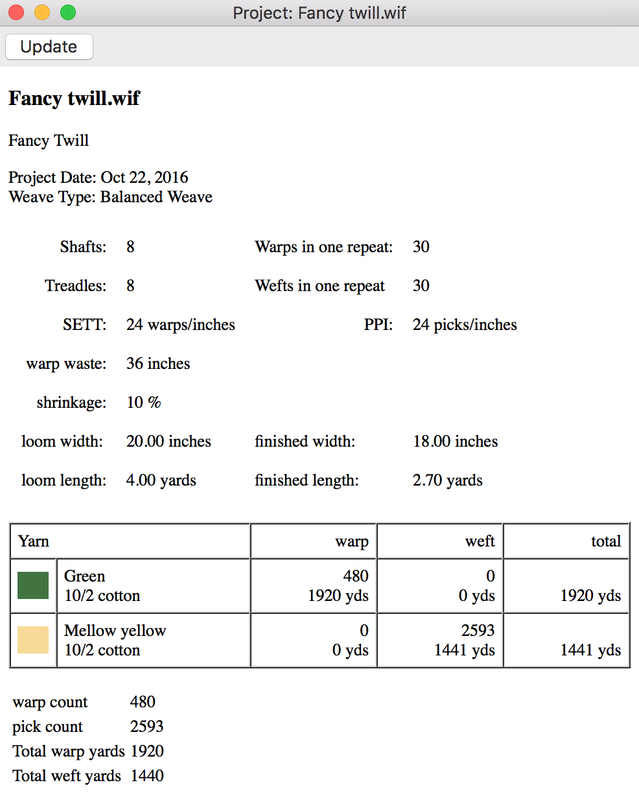 Computes yardage requirements for warp and weft, and for each yarn. Given fabric loom dimensions will compute finished fabric dimensions. Calculates warps based on exact pattern. Computes and displays the color order. Computes and displays sectional warping. Interleave drafts with custom ratios. Parallel threading for up to 4 lines. Find floats and edit as they are listed. Keeps track of threading using custom sized groups. Keep track of treadling either as treadles or lift plan. 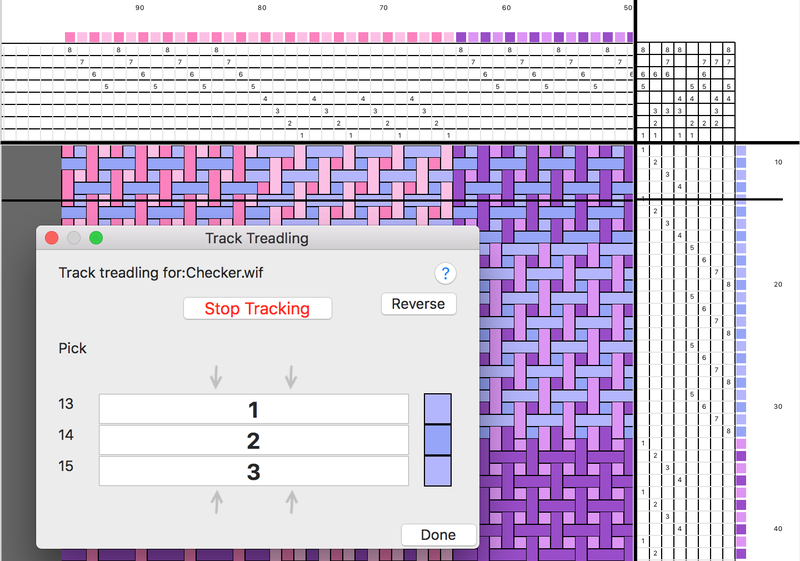 Both thread tracking and treadle tracking show yarn colors. Both tracking types provides options for customizing how you track.